Charley Prince: This town, I really think, is like something out of the Bible. Wild Bill: What part of the Bible? Charley Prince: The part right before God gets angry. Many legends have come down from the old west, and Hollywood has used their stories as the basis for dozens of motion pictures. James Butler Hickok, better known as "Wild Bill," was first committed to screen in the 1923 silent film bearing his name. Hickok - noted for the two Navy Colts he holstered in a red sash around his waist, with their ivory handles turned forward for the underhand or "twist" draw - was a civil war veteran who, at one point, acted as a spy for the Union. His legend and reputation as a man to be reckoned with was born in Springfield, Montana, on July 21, 1865, when he killed Dave Tutt, though the details of this encounter and its cause are still debated (a competition over the attentions of Susannah Moore is used in this film). Like most legends, accounts of his gunplay became notorious, and word of his ability to gun a man down - before his adversary had a chance to unholster his pistol - would limit those who would challenge him to the few trying to gain a reputation for themselves...most of whom didn't live to tell about it. He would go on to become sheriff of Abeline, Texas where, on October 5, 1871 he accidentally shot one of his deputies (a good friend), changing Wild Bill's outlook on gun fighting forever. He made his way to Deadwood, in the Dakota Territory, in order to raise money through prospecting to support his recent marriage. Here he would meet his end on August 2, 1876, which is where director Walter Hill's (The Long Riders, 48 Hours) 1985 Wild Bill begins: at his funeral, surrounded by his friends. Presented in black & white, the film opens with John Hurt's voiceover (as Charley Prince) recounting the friendship he had with Wild Bill (Jeff Bridges). Through a series of flashbacks, the history of Wild Bill and his legendary encounters are presented. 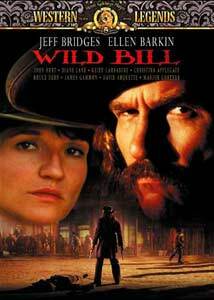 The story then moves forward to Bill's arrival in Deadwood Gulch, a rowdy, gold rush town, which is where we are introduced to his former acquaintance, Martha Jane Cannary - better known as Calamity Jane (Ellen Barkin) - as she bullwhips some card cheats into shape. We also meet Jack McCall (played by the whimpering David Arquette), who calls out Wild Bill, a threat Hickok doesn't take too seriously, given the boy's age. By this time in his life his eyesight is failing from glaucoma, and he spends his time in Deadwood drinking, playing cards and in the Chinese section smoking opium, which is where McCall first attempts to kill the legend. After losing his nerve, McCall hires on a group of killers, which sets the stage for the final confrontation at the No. 10 Saloon. Though big on stylistic cinematography, and containing a few exciting action scenes, in the end, one is left wondering what the purpose of this film was. As a biography, it doesn't cover much more than highlights from a few scattered incidents that built his reputation. As a retelling of the story of Hickok's ultimate assassination, from a historical perspective, the entire back story of his assassin, Jack McCall, is fabricated, as are the circumstances leading up to his death. The writers do weave some factual information into the story for credibility, but these, again, don't do anything but bring supposed motivation to McCall's character. What we are left with is revisionist history, based on distorted facts, and other than the death of Wild Bill, there is nothing of interest happening. However, historical accuracy aside, the film does feature decent performances by Jeff Bridges and Ellen Barkin; some of the flashbacks are stylish in their execution, and the inclusion of some accurate details, such as the No. 10 saloon and the "dead man's hand" (aces and eights) do prove interesting. We get a token appearance by Christina Applegate who, aside from having her breasts groped by Arquette's character, doesn't do a whole lot. The supporting roles by John Hurt, Diane Lane (as Susannah Moore), James Gammon (as California Joe), and cameos by Keith Carradine (as Buffalo Bill Cody) and Bruce Dern are all handled adequately, though none of these characters are really developed and serve more to pad the cast list than anything. In the end we have a lot of name dropping, a few action sequences, and see a tired old man, vision failing and addicted to opium, surrounded by the endearing friends who witnessed his last days, hunted down by a fictionalized killer. Image Transfer Review: The 1.85:1 anamorphic image is for the most part clean and free of any detrimental anomalies. The variety of presentation techniques does exhibit some noticable, though faithfully rendered, grain throughout, more pronounced in some shots. The look is slightly soft in places, with no signs of edge enhancement present. Colors are rich and vibrant where necessary, and the black & white segments have good tonal range. MGM even managed to leave the burned in subtitles intact, moving the alternate language subtitles higher up the screen, as I wish they would do on all releases that have hard subs in their theatrical presentation. Only some slight aliasing degrades the mark on this one. Audio Transfer Review: Audio is presented in Dolby Digital 5.1, which while sounding fine, does not utilize the rear channels to any great effect. Noise and distortion are absent, and frequency range is fully represented. A fine sounding, though not overly enveloping soundtrack. French and Spanish Prologic surround tracks are also available. Extras Review: The film's theatrical trailer is presented in anamorphic widescreen as the only supplement. While I wouldn't give this a complete pan, its deviations from historical fact make it more of a caricature of the legend than an account of Hickok's life, which probably accounts for my less-than-favorable bias towards the film. As a western, it has more of the feel of an Oliver Stone picture, with a barrage of odd angles, black & white, negative print and other stylized elements cut in as flashbacks and hallucinations. This might be one that grows on you though, so it may be worth a look.